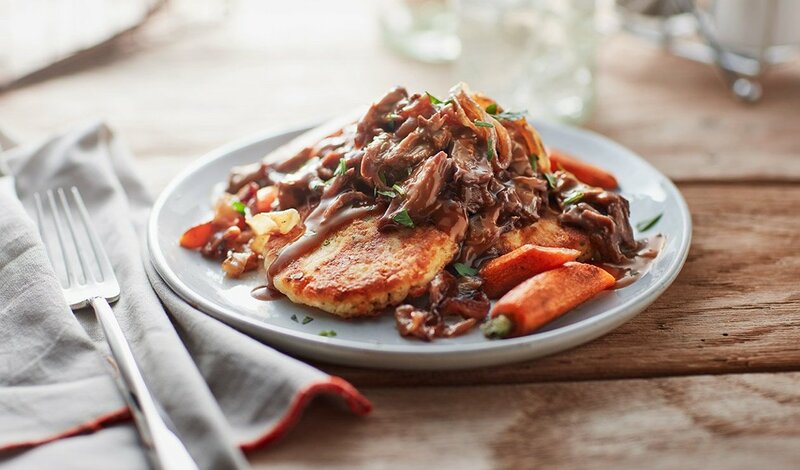 Potato pancakes loaded with tender braised beef, caramelized onions and carrots. Smothered with savory beef sauce. Cut beef into 5 cm cubes and season with salt and pepper. Sear in oil; remove beef and sauté onion. Add garlic and sauté. Deglaze with red wine. Add reserved beef and prepared demi-glace. Braise covered in 175°C oven with rosemary and thyme sprigs for 2.5 hours or until tender. Remove herb stems and beef. Shred beef and return to braising liquid; reserve warm. Combine all ingredients, mix and season to taste with salt and pepper. Use #20 scoop to portion about 30 pancakes. Press to flatten and reserve chilled. Pan fry (3 ea.) potato pancakes in half clarified butter and oil until golden brown and cooked through. Top potato pancakes with shredded braised beef, caramelized onions, carrots and reduced braising liquid. Garnish with parsley.